Sold on eBay by seller "BS"
Culture: Egyptian . Period: Late Period (664 B.C. - 332 B.C.). 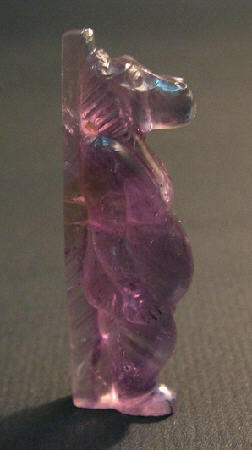 Material: Amethyst. Height: 4.5 cm. Condition Outstanding. Provenance: Private Collection. All items soldare guaranteed to be of the age or period stated in the listing. However, we do understand the nature of the antiquities trade and therefore will provide a full refund of the purchase price to any displeased buyer within 7 days for any reason, and for the lifetime of the item with written evidence from a reputable authority questioning it's authenticity. In both cases, the item must be in the same condition it was when we shipped it.